Yes, I’m writing about Nightlife. 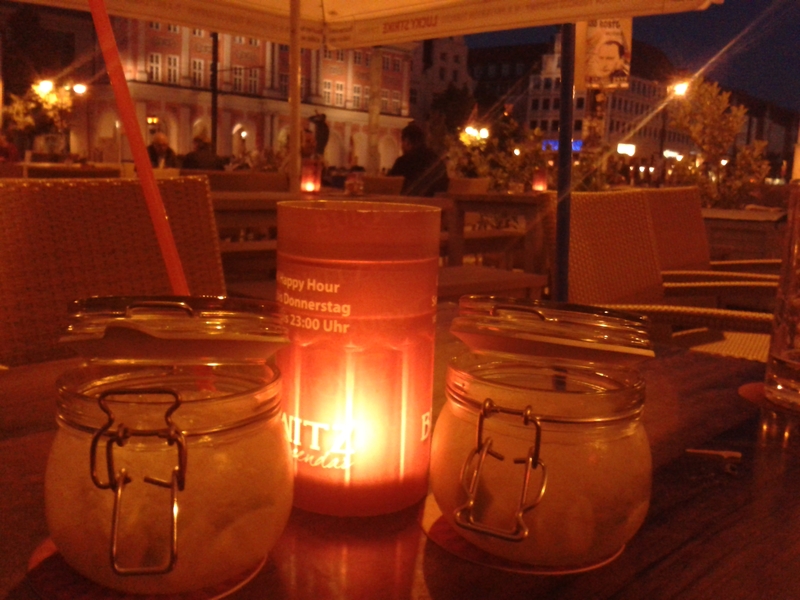 Especially if you are in a city like Rostock, where there’s a small, and welcoming pub or restaurant to find anywhere, and you don’t have the time to try each of them, to see if all our hints are true, you might want to read this. You want the exclusive view on historical buildings and enjoy a relax-where-tourists-gather-and-inhabitants-hurry-to-get-their-train-after-shopping-spirit at one of the most crowded (I mean that in a positive, entertaining, having-something-to-watch kind of way) places in Rostock ? Burwitz Legendär or Alex at “Neuer Markt” will be your hit! You want the relax-after-a-long-trip-on-high-bed-like-areas feeling with a huge range of colorful, partly mind blowing strong cocktails right in the sweet, charming “KTV”? Barfuss Bar is your place to go to!…. You have read enough comments on how sweet, cosy and fancy our pubs and bars are and still want to know how to get as much as possible for your last penny? Depending on your dates of stay you can look up here, if one of my personal recommendations has Happy Hour and when. For Example on Monday you can do pub hopping. Start at Planbar near “Doberaner Patz” with your first sweet, sour, colorful or strong Cocktails for €4,50 each from 18:00 – 19:00. You can also stat at Barfuss Bar, if starting right in the centre of our student-quater “KTV” works better for you and safe €2 per Cocktail there while absorbing the relaxing, familiar feeling, with moving music, on spacious lie down areas to bum around together. Or you choose it as your next place from 19:00 – 21:00. Also at Alex at “Neuer Markt” directly across the place when you come out of the tram, drinks are cheap on Mondays: €4,70 per Cocktail here with a great view on the town hall and the old fashioned style of our historic centre. Here You can stay from 21:00 to 23:00.
can have one drink at Alex and one at Burwitz and decide which one fits most to you, as Happy Hour in both of them is until 23:00. Afterwards you can check if there is something going on in one of the clubs, but usually there isn’t much on Mondays. If not, our beautiful Tram will take you home from “Neuer Markt”. Of course this can only be a very very small selection of Rostock-Nightlife, but this is so far my very personal recommendation, which inherits good chances to meet us, the poor students on our way to have a funny night without spending too much. For more detailed nightlife plans on specific days including clubbing and descriptions of how to get there, consider also my blogs Cheap Tuesday, Cheap Wednesday, Cheap Thursday. 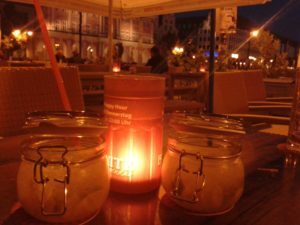 This entry was posted in BARfuss, Local Lifestyle, M-V, Mecklenburg Vorpommern, News, Pubs and Bars, Rostock & MV, Rostock & Warnemünde, Salsarico, The Barfuß-Lounge, The Party-Route and tagged alcohol, Bar, cheap, city, fun, KTV, party, restaurant, where2eat&drink, wine. Bookmark the permalink.